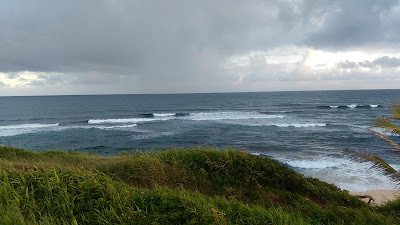 7.30am Hookipa has short period waist to occasional chest high waves with a bit of wind on. Another surfing/windsurfing north shore day for me, yet not as good as the day before. But that's because I'm spoiled. The windsurfers didn't seem to mind the short period waves instead. Photo from this gallery by Jimmie Hepp. The photo below instead is from the angular spreading swell about 10 days ago and that's where I left my heart. Pristine conditions. 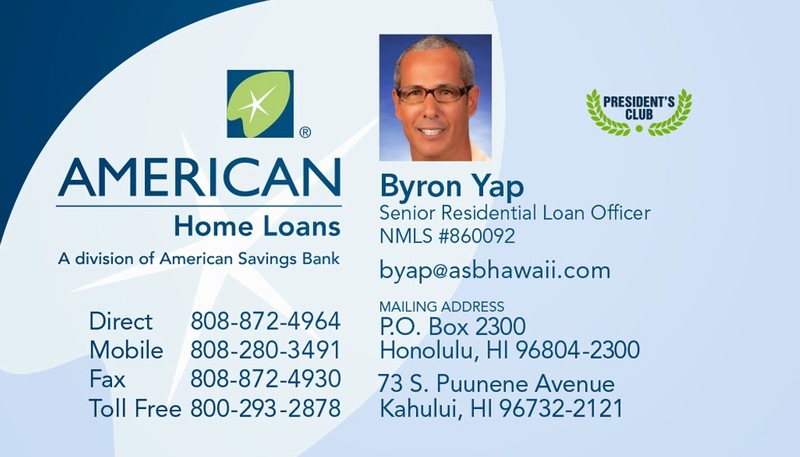 And since I'm getting a bit melodramatic, here's a video illustrating the life of a guy that I like and respect at lot: Dave Kalama. The moral of it: always listen to what a flag pole has to say to you! Below is the wind map from September 22. As you might remember, there was another fetch that - I pointed out - could send us an angular spreading swell. And it sure did. Notice how, just like the previous one, the readings have some east at the open ocean W and SE buoys and instead a tiny bit of west at the Lanai one. That's because when coming from a direction with some east, the waves refract over the southern tip of Lanai. I did a whole discussion with graphics in this post, in case you missed it. Unfortunately, this swell is much smaller than the previous one (the fetch was smaller). And that is also confirmed by what the webcam shows. Pretty low tide in the morning though, I'll keep checking it to see if a little more water improves the size later on. Current wind map below shows a small/weak NW fetch, the windswell fetch and a small south fetch. Unfortunately, the NW fetch is going to move north above the Aleutians, so today is pretty much the only day of wave generation for us (yesterday it was even weaker). That will result in a barely noticeable swell that Surfline is forecasting at 2f 10s between Wednesday and Thursday. Notice how much more than the usual 3-4 days those waves are going to take? That's because the wind in the fetch is not as strong as usual and it will only generate short period waves, which travel slower than longer period ones. To see a better NW swell, we'll have to wait quite a bit. The wind map below is forecasted to happen on October 5th and the related swell is forecasted by Surfline to hit between Saturday 8th and Sunday 9th around 6f 15s. I took my time this morning to make this call (but I think it came out allright), so here's the updated MC2km map for today at noon, showing a classic moderate windy day on the north shore. In no hurry to go check Hookipa, I kept watching the Lahaina webcam and after 20 minutes, a decent set rolled in. And I captured it for you guys. What a service! 6.30am Hookipa has short period waist to occasional chest high waves with a bit of wind on. Poor conditions overall. Champions league Napoli game at home. Second windsurf session at sunset. That's my day off yesterday. And the best thing is that the total amount of driving time was less than 5 minutes! I love living where I live. This is the me, check the whole gallery by Jimmie Hepp. I actually also took some pics myself. This is Levi Siver. Check where he took off. He's gonna land that aerial 360 smoothly in the spot where the tip of the mast is. He calculated perfectly the space he needed to move down the line to land safely on the open face and considering how difficult an aerial 360 already is as a move, for me that is mind blowing. Total control, like Felipe Toledo. As predicted (see the discussion on yesterday's call) the short period swell turned more to the east and went slightly down in size, reflecting perfectly the history of the fetch that generated it. 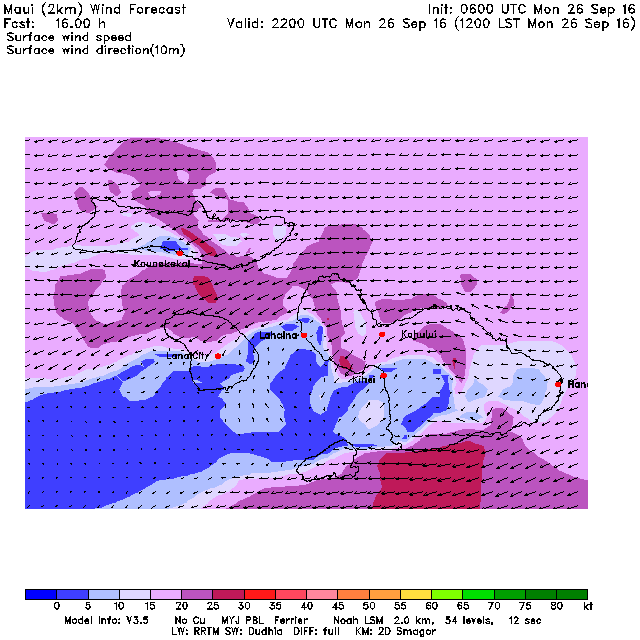 That's why I post the current wind map every day. So that you guys can have a picture of what's going on out there and try to keep it in mind for when the waves generated from all the different fetches arrive. Minimal southerly energy, but not flat on the south shore. - a fetch down south which is pretty strong but now aiming at the central America, so we'll rely on the angular spreading in a week. 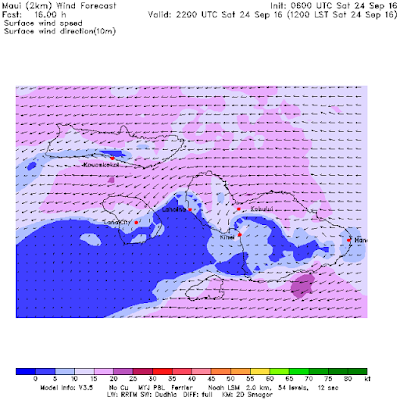 MC2km maps not updated yet, it should be windy again. 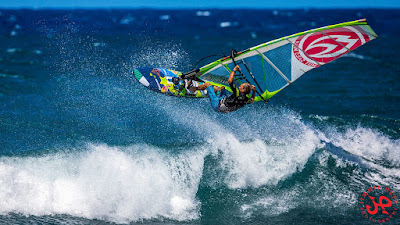 Surfing in the morning, work, windsurfing in the evening and another classic gorgeous Maui day is in the books for me. 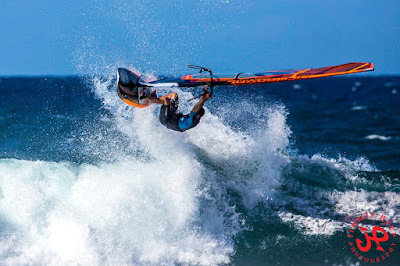 Overhead waves graced the windsurfers. The photo below is from this gallery by Jimmie Hepp. I don't have a surfing photo from yesterday, so I'm gonna use a short sequence from one of the angular spreading swell sessions from last week to illustrate once more an important aspect of the surfing etiquette. I caught this right that had a very fast line and there's a guy on the inside paddling out. Here he realizes that he will be on my way and starts changing his course to his right so that he can take the white water on the head and give me room to keep my line. Had he not done that, at this point I could still straighten out towards the beach to avoid the collision and give up my wave, but thanks to his respectful behavior, that wasn't necessary. Here's the frame that shows that I made the wave (went all the way to the beach). I did pass quite close to him, but I was in control and everything seemed safe to me. Maybe not so much to him, since he looked a bit scared. Later on, I thanked him for taking the wave on the head and apologized for the scare. So that was a good example of an etiquette rule that was observed. There's another rule that gets overlooked a lot though and I'd like to talk about it: the priority. Most surfers believe that as long as they are deeper than other surfers, they have priority and can go on as many waves as they want. Wrong. That rule applies when the spot is crowded and it's virtually impossible to keep the count of whose turn it is. But if instead that is possible, the main priority rule is exactly like the one they use in the WSL contests: you just caught a wave, you have to wait until everybody else in the lineup catches one. Doesn't matter if you paddle around everybody and sit deep. When the next wave comes, it should be the turn of the guy who's been waiting the longest. It would be nice if all surfers would put a couple of neurons into this. Thanks. Small stuff on the south shore, but 1f 15s can be fun. Still pretty good numbers at the northerly buoys, today will see overhead waves again. Stay tuned for the Hookipa report from the beach. This swell has exceeded most forecasts. Surfline only had it at 3 feet, Pat Caldwell called for 4, surprisingly only Windguru had it right, I wonder what model they use. Let's have a look at the fetch that created this swell to understand what happened. The map below is from the 24th. The fetch is NNW of us and it has a bit of red indicating winds of 20+ knots. It was still missing the most important component, specially for the building of the period, which is the wind strength, but it was close enough for the 9 seconds waves not to decay too much. This last one is from the 26th and as you can see, it moved a bit to the east and that's why today we notice a bit of that into the direction at the buoy. Today we'll see more and more of that easterly component as the day goes by, together with a slow decrease in the size. 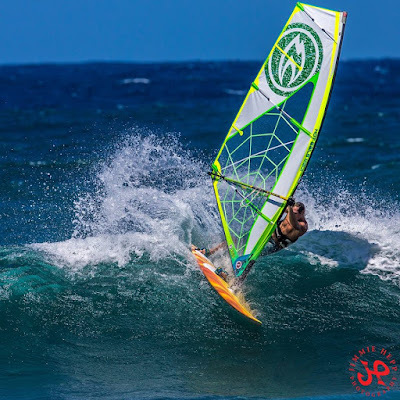 One more important factor to mention is that when the waves come from the north, Hookipa and all Maui's north shore don't get any shadowing from the other islands. 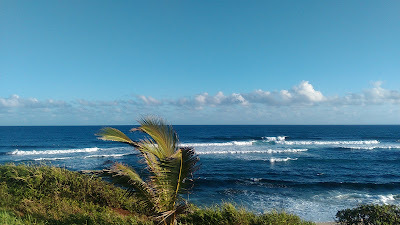 Thanks to that, yesterday even Honolua was breaking (knee to waist high at sunset). Current wind map below shows a wide windswell fetch, a small/weak NNE fetch and a fetch down south. This morning I did a beach report first, you'll find it below this post. This is a photo I took around 7am after my quick sesh. Waves were head high with occasional bigger sets, kinda clean and very consistent. Much bigger than yesterday as this photo from this gallery by Jimmie Hepp shows. 6f 9 seconds northerly swell is up and it will stay up all day. 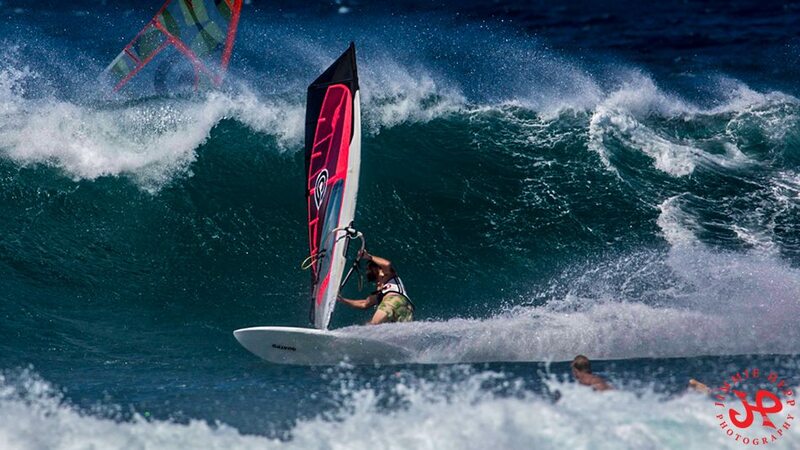 At Hookipa, that translates in the waves I described at the beginning. Minimal energy from the south. Current wind map shows a small/weak NW fetch, a pretty wide windswell fetch and a fetch down south. MC2km map at noon shows trades into the 15-20 knots range. 9 27. 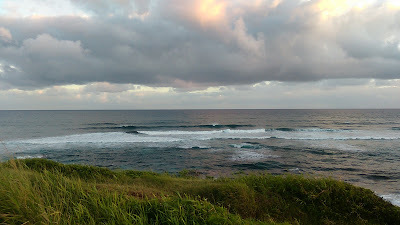 6.30am buoy says 6f 9s and Hookipa has semi clean head high waves with a light wind on them. I'll do the call later today. 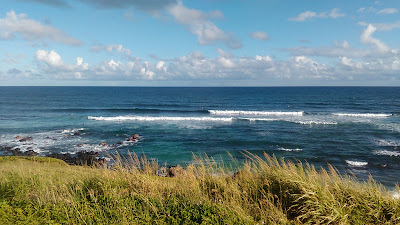 7.30am Hookipa has shoulder high windswell peaks with a light wind on them that is about to get stronger. 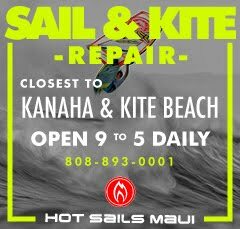 Fun Lahaina late morning session (still chest high at the spot I surfed!) 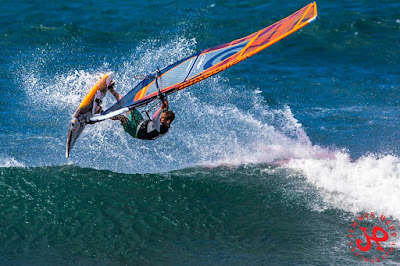 and cheeky windsurf session at sunset was my way of not wasting another drop dead gorgeous day in Maui yesterday. Once again, I picked the photo that shows the biggest wave out of this gallery by Jimmie Hepp to show what was going on at Hookipa in the middle of the day. But I don't like not having a surfing photo, so here's my coworker Russ in a sweet session we scored last week in the middle of the angular spreading swell. New pulse of short period northerly waves at the NW buoy during the night, as the graph below shows (dark blue line with a hump throughout the night). Waimea is already feeling a bit of that energy at 6am, while Pauwela still isn't, but it will during the day. Still some background energy from the SSW at the Lanai buoy. That's what that translates to in the webcam for the laziest of you who can't be bothered to check. Webcams are obviously a great tool for choosing where to surf, as they give you a visual indication of size, consistency, wind and crowd at that particular spot. The Front Street cam was by far the website I checked the most on my phone during last week. Normally it's the Surfline buoys. Current wind map shows a few fetches in the north Pacific that will keep Hookipa from going flat. As you can see, nothing major, since the wind barbs are only green (12 to 16 knots), so they are going to send small, short period waves. You definitely want to see some red in the fetch (20+ knots) before you get excited. Down south there's a fetch with some red, but it's way more far away and it's shooting east of us so we'll have to rely on the angular spreading again. Each single one of those factors helps the wave generation and when they happen all together (and they do occasionally in winter), that's when the surf gets in the giant category. MC2km map at noon shows medium/strong trades. 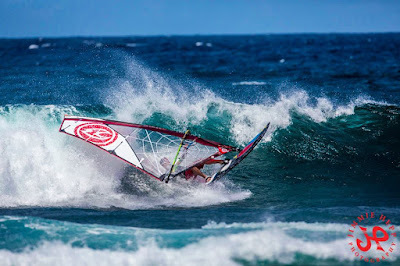 Morning session at Hookipa was - as I wrote in the beach update - not the most thrilling. 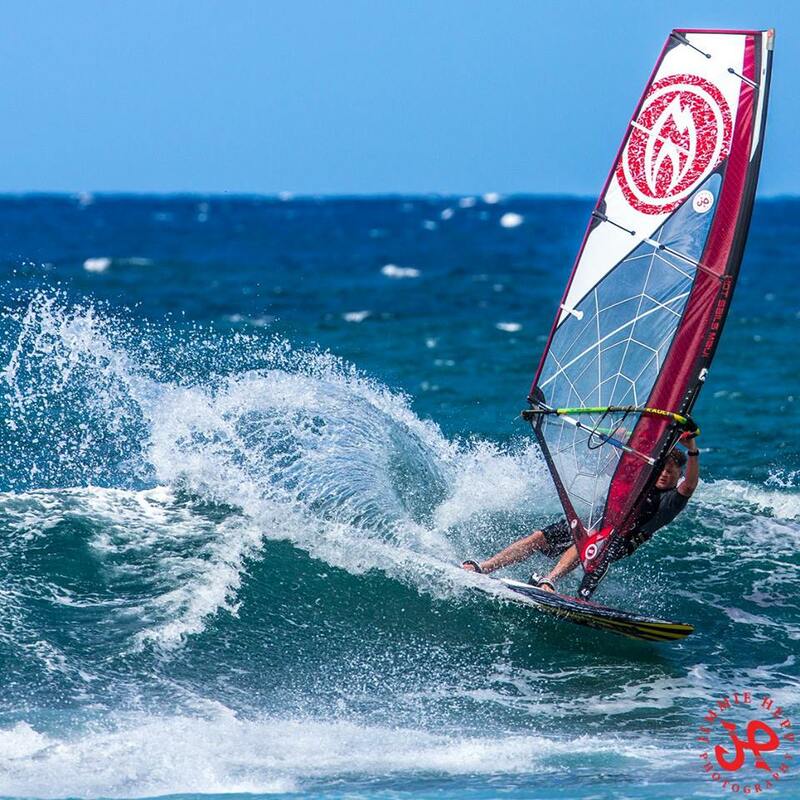 Here's Fabrizio (who's from my same home town) showing a stylish bottom turn before going back home to watch a Napoli game. Later on the windsurfers took over. This is the biggest wave out of this gallery by Jimmie Hepp. Must have been the wave of the day, since the other ones looked a lot smaller. I had a morning shift at work and in between helping customers choosing the perfect rental board for their ability/preferences, I checked the Lahaina webcam several times and it looked absolutely gorgeous. Still head high sets at the harbor, as glassy as it gets all morning, what a swell this has been. I drove there in the late afternoon and scored an uncrowded session at one of my favorite breaks. I was first by myself (which I always love, specially there) and the later I was joined by west side shaper Josh Weinsfield. We trades waves, we trades boards and we admired the spectacular sunset go off. Josh was really impressed by my board. I got it on craigslist and that thing has made surfing the small south shore waves even more fun! Ladies and gentlemen, meet the Lil Rascal by Proctor surfboards. Mine is a 5.7 and it's not for sale. NW swell disappeared at the NW buoy and got smaller at Waimea, so you would think it's gonna decrease in Maui too. And it's probably going to be a bit smaller than yesterday, but I remember the weak NW fetch that generated it staying in place for long time, so it's not going to be flat. 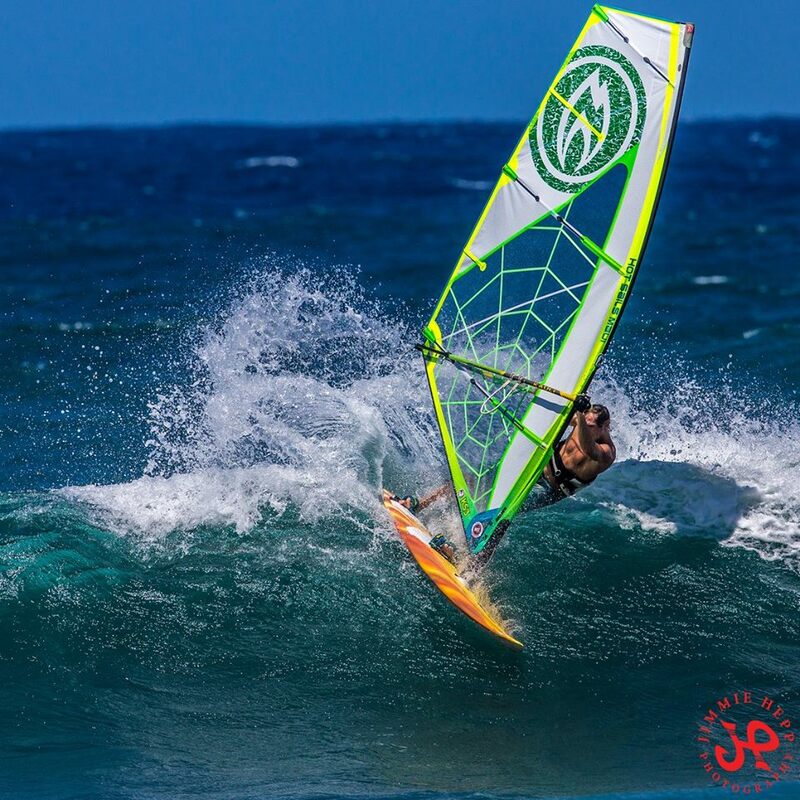 A bit hard to surf, but the windsurfers will have the help of the added windswell when the wind will pick up later in the day. As you can see, there's still traces of the angular spreading swell and Lahaina looks good again on the cam. I have no doubt where I'm gonna spend the morning. - the weak NW fetch that has moved and now is a weak (but close) N fetch. North shore surfers who don't like to drive should be very thankful for this fetch. 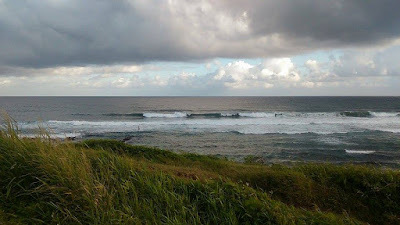 Never got strong, but stayed in place for many days and will cause the north shore not to go flat most of this week. - a fetch down south that could bring a small south swell in a week. 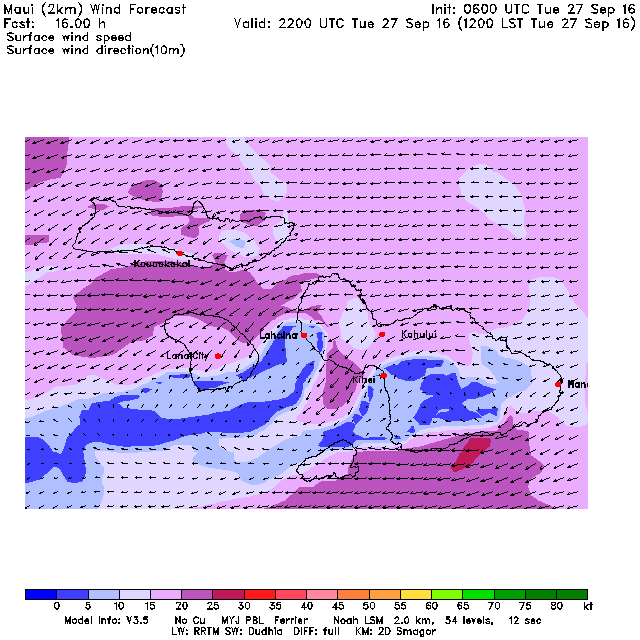 MC2km maps not updated at 7.30am (sorry about the late call, btw), according to the NAM model on windguru, windsurfing should happen today. But not if you look at the HRW one (too onshore). And it looks even worse if you look at the GFS one at the top of their page. One of those days in which you have to wait and see, I guess. 6.20am Hookipa has shoulder high peaks with a light wind on them. Kinda clean, but not the most thrilling ride of your life. Just one (gorgeous) early morning session in Lahaina for me yesterday, as I hit the bottom of the energy level. 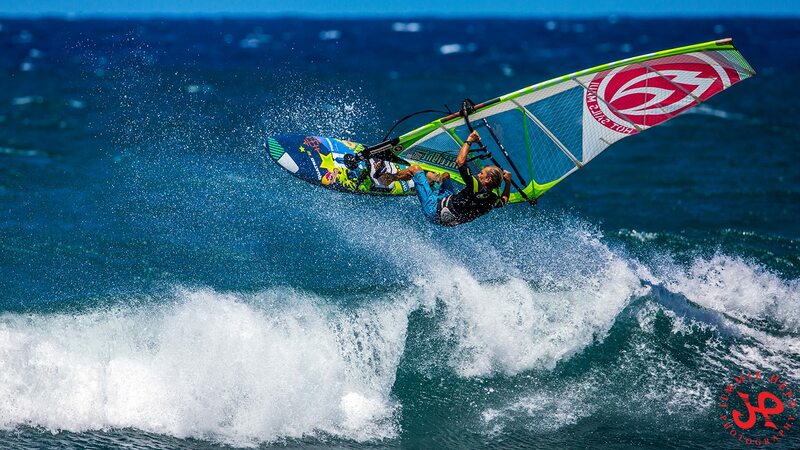 Hookipa looked kinda fun for windsurfing at lunch time, but even though I did have an hour before work, I couldn't pull it off. 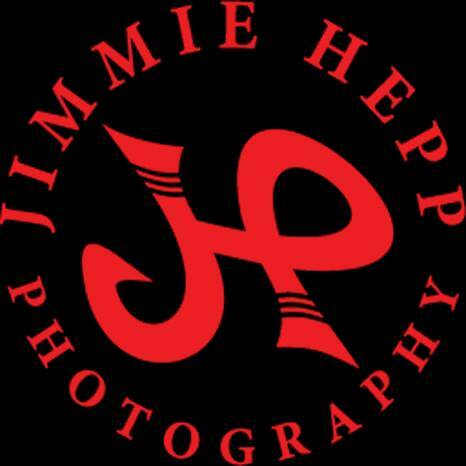 This is the biggest wave I've seen in Jimmie Hepp's gallery on facebook. 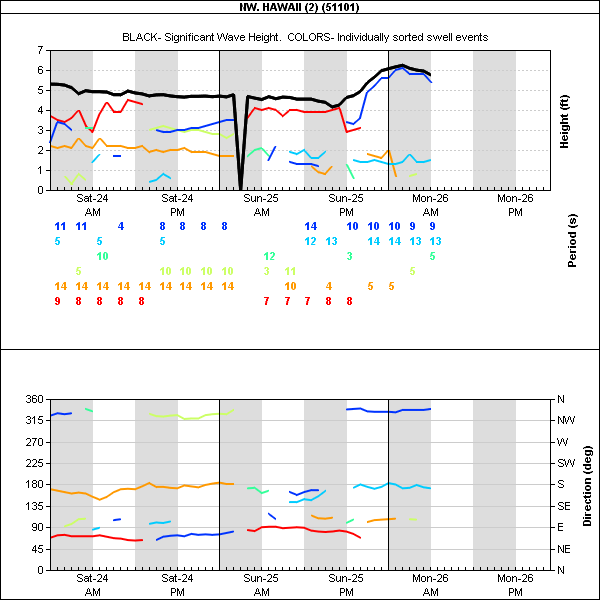 If that 3f reading at the NW buoy is not a glitch, we might see a little bump compared to yesterday at Hookipa. But I wouldn't expect nothing much bigger than the occasional head high set. Still good numbers at the buoys for this lovely south swell. 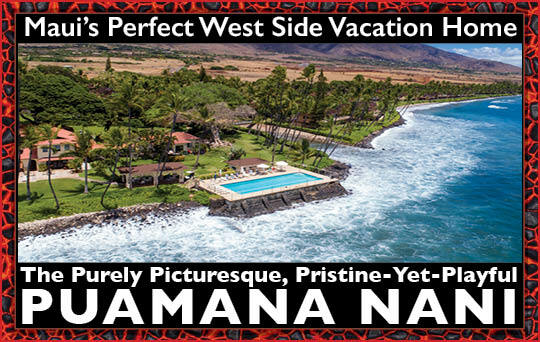 Surfing the Lahaina side is still definitely an option today. Check the webcam for wind and size visual indications. 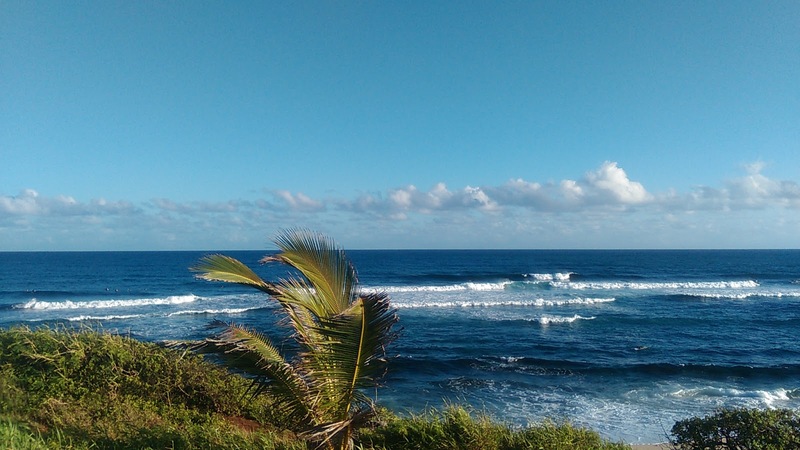 - the weak NW fetch responsible for the steady supply of small waves on the north shore until at least Wednesday. It got a little closer, which is good from the energy dissipation point of view, but its winds are still pretty light, so don't expect anything huge. 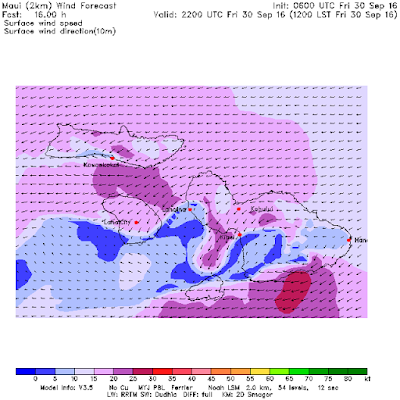 MC2km map at noon shows plenty wind for wind related sports on the north shore. 6.20am I didn't see anything bigger than waist high all the way to lahaina, which instead seems to still have some sets up to head high. Back to the "normal" two sessions yesterday, I definitely felt the tiredness of the six of the day before. The waves were pumping on the Lahaina side, Mala looked like the best spot, but packed. My second session was at Maalaea that instead only had three guys out. It was head high when I took this picture, unfortunately it went down to waist to chest high ones when I paddled out. This guys is riding a 9.0 Bic longboard (a very high performance shape) with no center fin for more speed. 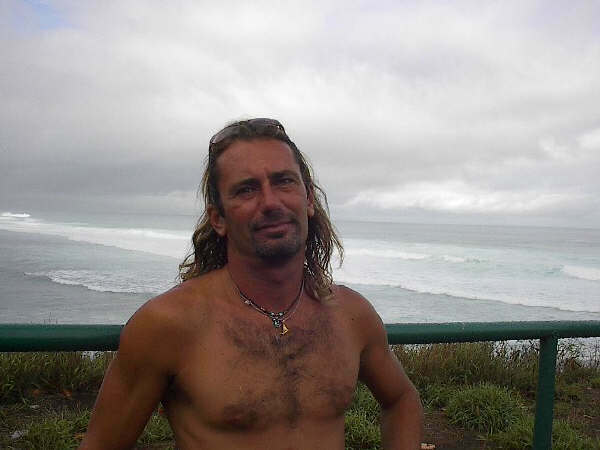 Blog reader Ralph Sifford was one of the three surfers. Another nice one for the finless rider. A tiny bit of energy from NW at those buoys above, but mostly windswell on Maui's north shore. Surfline calls for 2f 11s from NW tomorrow. This energy will come from the weak NW fetch I pointed out on the wind maps of the past few days. 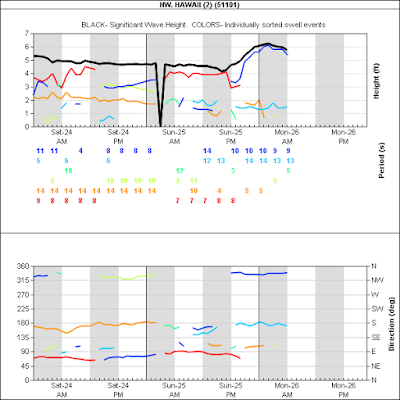 Angular swell still up at the buoys, even thought the period went down a bit. I'm very impressed by the energy of this swell, I wasn't expecting so much of it from a swell that was mostly aimed somewhere else, really. 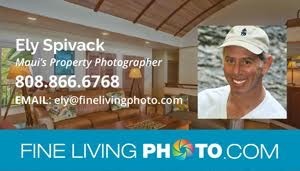 Lahaina will be the call again for me, stay tuned for the beach reports. Current wind map shows the weak (but getting wider) NW fetch, the windswell fetch and down south a fetch that I would have not even circled if it wasn't for how strong the current angular spreading swell has been. That fetch is shooting towards South America, I'm really curious to see if we're gonna get something in a week or not. MC2km maps not updated yet, the two models at the bottom of the Windguru page show a day of strong easterly wind. The top one also show a lot of rain. Which is confirmed in the early morning. The sound of the hard rain actually woke me up earlier than usual. Or was it because I went to sleep exhausted at 7.15pm? Gonna be another good day, you guys... don't waste it! 70am lahaina side waist to head high and clean. Occasionally overhead. That's how I'm gonna describe my surfing day on the Lahaina side yesterday. Five would have been a record already. Olowalu was firing, here's some shots. You don't often see sections and turns like that there. The morning high tide backwash was doing all kind of things to the wave, like creating sudden unexpected overhead peaks. There were some moments in the afternoon too. I saw one wave that looked like a perfect lower Trestles right, sun reflections on the wave included. I thought I had my last session and was done for the day at least three times. I was chilling out after my fifth one, when my buddy Peter came out of the water saying:"let's go look for a high tide spot!" Looks like we found it. I got some gopro clips of those perfectly clean little waves (the quality factor was through the roof), but absolutely no time to edit them. Good, we got some small days ahead next week, I'll have some material to post. Only windswell on the north shore. I didn't even check Hookipa yesterday and I won't this morning either. Fantastic numbers at the buoys, this angular spreading swell is still pumping. Current wind map shows a weak NW fetch, the usual windswell fetch and one down south that COULD give us another angular spread swell in a week. 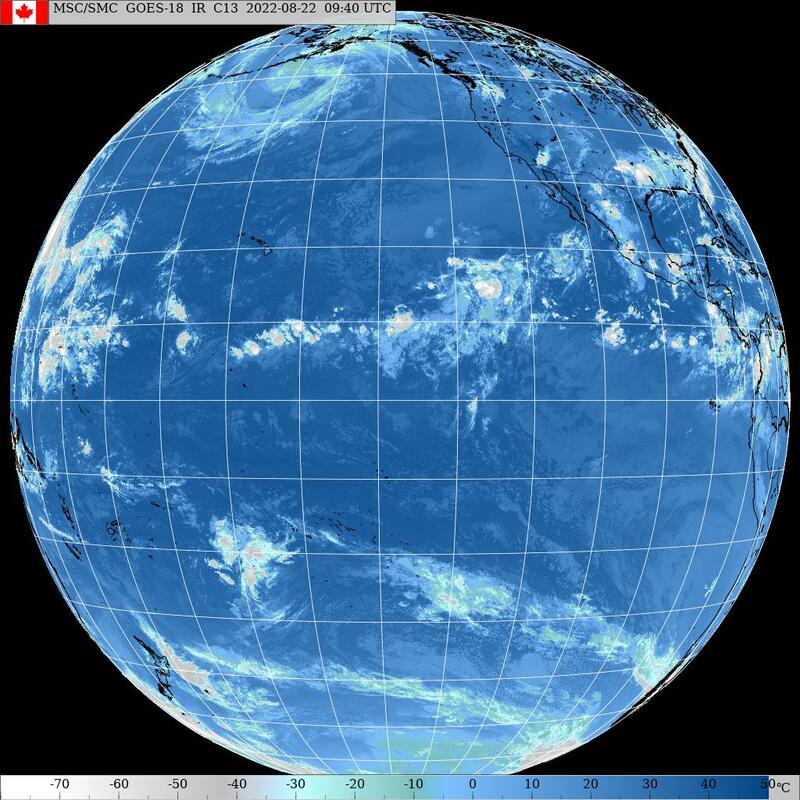 Just like this current one, it's not gonna hit the Samoa buoy at all, so the only way to find out if it happens will be by checking the local buoys. MC2km maps not updated yet, it should be a light to moderate trades day.